The Tibetan Plateau has experienced more rapid climate warming than the global average, coupled with greater interannual variation in precipitation over the past 50 years. How will such dramatic climate change influence the structure and function of alpine grasslands? Interest in this topic is high because of its importance to the sustainable development of animal husbandry and the livelihood of Tibetan inhabitants. 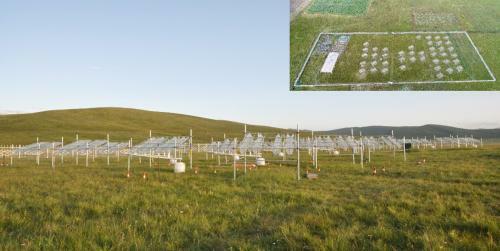 In 2011, HE Jinsheng's research team at the Northwest Institute of Plateau Biology, Chinese Academy of Sciences, collaborating with scientists from Peking University, established a warming-by-precipitation manipulative experiment at the Haibei National Field Research Station of Alpine Grassland Ecosystem. By combining the field manipulative experiment, 32 years of field monitoring and a meta-analysis from nine sites across the plateau, the impact of climate change on species composition and net primary productivity in Tibetan alpine grasslands was investigated. The results have been published online in PNAS in a paper entitled "Shifting plant species composition in response to climate change stabilizes grassland primary production." The study showed that, although the Haibei station became warmer and drier, aboveground net primary productivity did not vary systematically over the past 32 years. Meanwhile, the relative contribution of plant functional groups to total productivity changed significantly; over time, the productivity of grasses increased, and that of sedges decreased. The shifted species composition enabled the aggregate community to access more water and thus buffered the community to a stabilization of productivity under warming-induced drier conditions. The manipulative experiment further confirmed that warming had no impact on any aspect of net primary productivity, whereas drought shifted net primary productivity allocation belowground without affecting total net primary productivity. These results suggest that climate warming affects alpine grassland productivity through changing soil water content; more importantly, shifting plant species composition stabilizes grassland primary production under climate change. This study was supported by grants from the Strategic Priority Research Program of the Chinese Academy of Sciences, the National Basic Research Program of China, and the National Natural Science Foundation of China.